Morecambe striker Rhys Turner has returned to former club Stockport County on loan until the end of the season. The 22-year-old is back with the National League North side having scored six goals in 21 games during a previous spell at Edgeley Park before joining Oldham Athletic in January 2014. Turner arrived at Morecambe after leaving Boundary Park in the summer 2016 and has scored twice in 44 appearances for Jim Bentley’s side, nine of those coming this season. County boss Jim Gannon said: “We have been looking to strengthen our attacking options going into the second half of the season and Rhys is a great addition. 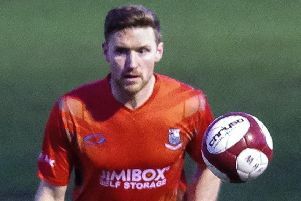 The Preston-born forward first joined the Hatters in August 2013 having scored 63 goals in one season for Myerscough College under the watchful eye of Lancaster City manager Phil Brown. Turner also had a spell at Giant Axe during that time. He could make his second County debut against National League North Leaders Salford City on Saturday with Stockport currently eighth in the table and pushing for the play-offs.